This entry was posted on January 26, 2015 by Tinteán Editorial Team/EMcK, in Interview, Sport and tagged Soccer, Sunderland FC. Bookmark the permalink. 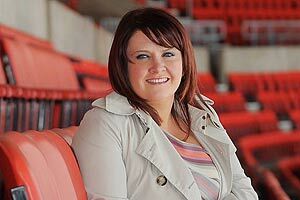 Northern Ireland’s Margaret Byrne is CEO of Premiership club Sunderland. She tells John Hagan about her background, how she scored a dream job, and her role in a great soccer club. Q: You were born in Northern Ireland. Describe something of your early life there. A: I had a lovely childhood. I grew up in Dromintee, Co Armagh as one of 4 children. We didn’t have a lot of money when we were growing up but then again, neither did anyone at home. It was a simple, yet lovely childhood. Q: What led you to take up law? A: I initially wanted to do something with marketing or business; however, there are quite a few lawyers in my family, so it was inevitable that at some stage I would be drawn to it. After my initial degree in Consumer Studies, I did what is known as a conversion course (Post Graduate Diploma in Law). My plan was to return to Northern Ireland and practise as a solicitor, but I enjoyed practising in London and decided to stay on a while. Q: How does a young Northern Irish solicitor get to be CEO of a Premier League soccer club? A: By a heck of a lot of hard work! When working in London I applied for the position of Club Secretary and In-house Lawyer at Sunderland AFC. After five interviews, I was offered the job and started in January 2007. I worked very hard and all legal work came my way, as well as the administration side of football operations. I was asked to be Company Secretary after six months and I was then invited onto the Board as Legal Director in December 2009. In May 2011, the Chairman asked if I would take up the position of CEO and I was delighted to assume the role. Q: What does your job as CEO of Sunderland Football Club entail? A: I oversee all aspects of the club – however, in each department we have specialists in position in the individual areas. The most important part is what actually happens on the pitch, where the Head Coach obviously coaches and selects the team. He works with the Sporting Director on the recruitment of players. I oversee the financial side of any transactions and ensure they are within the parameters of our budget. We have many different departments – accounts, medical, academy, communications, marketing etc and my job is easier as we have so many good people heading up the departments. We also try to be innovative and as such we have formed SAFC Global – with a worldwide outreach programme, we hold concerts at the Stadium of Light and we also have an external events company – 1879 Events Management Ltd.
Q: Have you always been interested in football? A: Yes, I have always been a bit of a tomboy. When I was younger we used to go to see Leicester at Filbert Street and I grew up playing football matches with all my cousins. I don’t think any of my extended family are too surprised that I am working in football. Q: How influential was Sunderland’s Irish connection in luring you to the club? A: I was intrigued with the position itself initially, rather than the Irish connection. Q: Why are links between Sunderland Football Club and Ireland so strong? A: There has always been a strong link with Ireland. Way back in 1936 John Feenan, a County Down full-back joined the Wearsiders [Sunderland] from Belfast Celtic, coincidentally the same year that Charlie Hurley was born and of course Charlie was and still remains both a Sunderland and Republic of Ireland legend. Over the years there have been a large number of Irish players who have played for Sunderland and this has helped to build a strong connection between the club, the city and Ireland. Q: Manchester City recently established strong links with Australian club Melbourne City. Do you ever see Sunderland following this example? A: Each club has a strategy on where in world they want to be. Manchester City are developing links in Australia and New York at present. Our club has strong links in Africa and Washington DC. In due course, we want SAFC Global to grow, but we have to ensure we get it right first. Q: As CEO of Sunderland and a member of Premier League Advisory Board, are you ever made to feel like a token female member of what must be a predominantly male executive? A: No, never. It is predominantly male, but I believe I am well respected by my peers and I do a good job representing clubs on the Legal Advisory Board. Q: What do you see as being the major problems facing English Premiership football clubs over the next decade? A: I see it being positive rather than having major problems over the next decade. The league is going from strength to strength and the interest across the globe is phenomenal – currently over 4 billion people watch it worldwide and to be a part of it is great for the club and the city of Sunderland. Q: Now that you live in the North East of England, what do you miss about Northern Ireland? A: I miss my family and the ability to see family members as much as I would like to. However, the North East reminds me of home. The people are friendly and enjoy a bit of “craic” as well. A: I enjoy the odd glass of white wine and I love to read (especially Sheila O’ Flanagan’s novels).